I was reminded of two of Allah’s most beautiful names, and perfect attributes just recently – As-Sami‘ (the all-Hearing) and al-Mujib (The Answerer/Responsive). My friend came over and was sharing her experiences of Hajj with me, may Allah accept it from her (ameen). She recalled tawaaf, and said that as she was going around the ka’bah, and was calling upon Allah, making du’a to the Mighty, the Responsive, she momentarily took in the scene around her. She thought: all the waves of people around her, also encircling the ka’bah, were calling out to Him too, making du‘a to Him too, and yet He, Most High, could not only hear her, but could hear all of them. Subhan’Allah, how amazing is that? Allah hears all of those people, and each and every one of His creation, because he is perfect and unlike his creation in His Hearing: He is as-Sami‘. Whilst she was telling me that, it reminded me of an incident from the life of our beloved Messenger SAW where Umm-al-Mu’mineen, Aishah (RA) also noticed the perfection of Allah’s attribute of being the All-Hearing. Khawlah bint Tha’labah (RA) came to complain to Prophet Muhammad SAW about her husband. Although, our mother, Aishah (RA) was fairly near to Rasullullah SAW, she could barely hear the exchange of words between the Messenger of Allah SAW and Khawlah (RA). Yet Allah SWT, from above the seven heavens, not only heard Khawlah (RA), but also revealed an ayah about her, that will be recited (and will remain) in the book of Allah until the Day of Judgment. Ibn al-Qayyim rahimahullah in describing the greatness of Allah, says about His hearing “…He hears all voices, and does not mistake one for another; He hears them all, in all the different languages and with all their varied requests and pleas. No voice distracts Him from hearing another, He does not confuse their requests, and He never tires of hearing the pleas of those in need.” Allahu Akbar! You know, that quote is particularly amazing to me because of my nature. I don’t possess the quality that women are supposedly deemed to have: the ability to multi-task. I can’t do it. If I’m in the kitchen cooking for example and somebody is speaking to me, just one person, I’ll have to stop cooking to listen to the person if I’m to digest what they’re saying. Or at least slow down my chores quite drastically in order to follow their story. My family will bear testament to the fact that I often ask them to repeat things when they speak to me whilst I’m doing something else! I usually cannot do two things at once, sometimes even the simplest of things. But Allah, Most High, has no trouble hearing us all, all at once. In all our different tongues, at different places subhan’Allah. Whilst my friend was making Hajj, some of us were beseeching Allah at some point too. Yet, He heard her, and hears us; and He responded to her, and responds to us, subhan’Allah. So whether you whisper to Allah to help and guide you in a sad moment, or recite His praises a little louder on days such as Eid, know that He hears you. And govern your behaviour – specifically, your words – around that. I was watching a lecture by Sheikh Navaid Aziz, hafidhahullah, entitled ‘What You Need To Succeed’ – a good lecture and reminder about how we can use and improve the different areas of our lives, such as family, deen and education, to attain ultimate success, both in this life and the next. This links to a beautiful du’a that Allah SWT teaches us in the Qur’an (and which Brother Navaid finished with) which is ‘Rabbanaa aatinaa fid dunyaa hasanah, wa fil aakhirati hasanah, wa ghinaa adhaaban naar’ (2:201)*. The Sheikh’s central message was that we are all living for one moment in our lives, and that is the moment before our deaths. Moreover, that the deed we die upon will be the deed that we are raised upon on the Day of Judgment. As Rasullullah SAW stated: ‘whoever dies upon something, he will be resurrected upon it’ (Al Hakim).The Sheikh continued that Allah SWT has given us the OPPORTUNITY to die a good death, to accrue good deeds; the best of which being those that continue (sadaqah jaariyah), those that impact humanity, as the reward is manifold and will continue beyond one’s death (examples that come to mind are teaching, writing beneficial articles, building mosques, etc). Then he mentioned the gem of the lecture, a beautiful reflection, and a man whose place with Allah, His Messenger, SAW, and Jibreel is incredible. I’ve heard the story of An Najashi*; I’ve read about An Najashi in the seerah of Rasullullah SAW; I’ve heard that Allah’s Messenger SAW lead his janazah. But subhan’Allah, I’ve never pondered upon his death…and this is what Brother Navaid did: he informed the audience and viewers that the type of death we want is like that of Najashi’s. How so, one might ask? Let’s analyse how the announcement of his life’s end came, RA. Brother Navaid reminded us that it wasn’t the companions who told the Messenger of Allah SAW that An Najashi had died, that’s not what happened. Rather, it was actually Allah’s Messenger SAW who stated: ‘Today, a righteous man has died. So pray for your brother…’ And it was Jibreel AS who informed our beloved Messenger SAW about this. And the One who initiated this message was Allah, Most High. Allah told Jibreel AS. Honestly, this brought tears to my eyes. Imagine that. Allah says about you: a righteous man/woman has died today. Allah, Al Haqq, bears testimony to your righteousness. The Most Praiseworthy praises you. SubhanAllah! Then, who does Allah inform of your death as a righteous human being? A noble angel. The angel that descended with verses from the book of Allah from the lofty heavens to this earth. The book we love, the book we strive to memorise. The angel that reviewed the Qur’an with the best of Creation, the Messenger of Allah SAW. The angel that came to the Prophet SAW in the form of a man, and taught us Islam, iman and ihsan. Allah informs this noble angel. This blessed creation of Allah then says about you: a righteous man [or woman] has died today. Next, who does Jibreel tell? None other than the last and final Messenger, SAW. The best man to walk this earth. The one whom Allah describes as a mercy to mankind. The best of all Prophets, the best of all people. And what does Allah’s Messenger SAW describe you as? A righteous man…rajulun saalih. Finally, who does Rasullullah SAW convey the news to? Who is seeking Allah’s forgiveness for you at your janaaza? The Sahaba. The best generation of Islam. Subhan’Allah, I found reflecting upon this is to be overwhelming….He was granted honour upon honour, RA. From the way he was described, to the nobility and merits of the beings who praised him, right to the rank of the people who sought his forgiveness…may Allah have mercy on this truly righteous man. And may Allah, Al Mu’izz, also honour us, bless us with a good ending and write us among the righteous, ameen. Please share if you have found this beneficial; JazakumAllahu Khairan. *The du’a transliterated in the first paragraph, which Allah teaches us in the Qur’an, translates to: ‘Our Lord, grant us in this world that which is good, and in the hereafter, that which is good, and save us from the punishment of the fire’ (2:21) . *An-Najashi: The King of Abyssinia when the early Muslims emigrated from Makkah and sought refuge in Abyssinia. An-Najashi granted the Muslims refuge. He was at first a Christian, but accepted, and died in a state of Islam, alhamdullilah. Here is a link to the lecture on which this article is based: http://www.youtube.com/watch?gl=GB&hl=en-GB&client=mv-google&v=euh8bcUSdug&nomobile=1May Allah reward speaker abundantly, ameen. I know that as Muslim women, we can sometimes feel like we’re missing out when it’s that time of the month during Ramadan; you feel like, I can’t pray, I can’t fast, and you’d really like to reap the barrakah and reward of this blessed month, yet you…’can’t’. This is particularly true of the last ten nights, I think, where the nights are blessed and thus, one has a heightened desire to worship Allah and draw nearer to Him. So with this ‘missing out’ feeling that some sisters may experience in mind, I thought I’d share a completely different way to look at not being able to pray/fast during some portion of Ramadan. I was watching a lecture entitled ‘The Halftime Report’ a week or so back, where Sh. Omar Suleiman and Ustadh Nouman Ali Khan were presenting a lecture on Ramadan, and taking questions regarding this blessed month, too. I think a sister asked about what she could do if she was on her menses during the last ten nights of Ramadan. And although they answered this and gave her some ideas of ibaadat that she could do, what I found particularly lovely and hope inducing was the different and refreshing way to look at not being able to pray or fast during these nights. And by way of analogy, in Islam, the sick person gets the rewards of the good deeds he used to do before he was unable to due to getting ill. So, insha’Allah, the woman who wanted to fast, wanted to pray in some portion of this month but couldn’t due to Allah’s decree – we ask Allah to reward her according to what she normally would’ve done. Ameen. Furthermore (yep, there’s more khair! ), we know that actions are judged by their intentions, so she will also, insha’Allah, get the reward of what she had *intended* to do. Truly, Allah is al-Kareem, Ar-Ra’uf, Ar-Raheem. May Allah accept from us what we do in this month, and beyond, multiply its reward, and forgive us our shortcomings – ameen. – © Umm Isma’il, 2014. Yesterday, I was sitting on my prayer mat after finishing my salah. My 18 month old toddler was throwing around this small, green, cube, plastic object. He was chucking it around the living room: from one end to another, onto the sofa, onto the coffee table. After throwing it, he would go after it, pick it up and then proceed to throw it somewhere else. Lately, sometimes, my little one wants things that he can do, done for him. So he will see his favourite toy for example, his dragon, and say ‘ga!’, which means he wants me to pick it up for him and bring it to him. So I say to him ‘no, you get it, Hooyo, you can get it’. And then he will walk to it and pick it up it. So as he was throwing this green, cubed, plastic object around, he at one point wanted me to get it for him, although he could easily retrieve it himself. So I gently encouraged him to pick it up himself, and he did. After more chucking around, unbeknown to me, his little object landed on the coffee table; on the far end of the coffee table that was up against a wall, and was difficult for him to get to. I was doing my dhikr, I think, so I didn’t notice. I just heard a few toddler ‘I’m not happy’ kind of moans/whimpers. I looked up from my mat, and saw my prince trying to tiptoe, so that he could extend his arms further across the table, in order to retrieve his chucking-around object. I immediately got up and, I think, said something like ‘aww, Hooyo, I can get it for you’, grabbed the object and handed it to him. And subhan’Allah, something clicked. An analogy; a truth that is present in our relationship with Allah ‘azza wa jall. And it’s this: Allah will help us, but we have to try too, we have to make the effort, too. I immediately helped my little one when *I saw him trying*, trying to tiptoe his little feet to reach for help. He called out for help (well, rather whimpered), but he also *did his part*. This is how we have to be with Allah. We make du’a, we ask Allah for His help, but we also do our part, of what we can as well. *This* is the procedure that we are taught in the Qur’an and the Sunnah. If you look at the story of Musa, Musa AS is told to strike the sea with his stick (20:77), he does his part, and *then* Allah splits the sea. Maryam A.S. is told to shake the date tree (19:25), she does her part, *then* it yields its fruits to her. In the Sunnah, the Prophet SAW teaches us to tie our camel first, i.e. to do our part, and *then* to put our trust in Allah (At-Tirmidhi). He, SAW, also talks about if we put out trust in Allah like we should, He would provide for us like He provides for the birds that go out in the morning hungry, and then return full (At-Tirmidhi). What’s interesting to note here is this: before Allah SWT provides for the birds, what do they do? *They go out in the morning* i.e. they do something. Subhan’Allah. We should make du’a…but we should do what we can too, using the ability that our Rabb endowed us with. It wouldn’t be proper to expect Allah’s help when we’re not doing what we can. So for us not to work, for example, when we are able to, and to say “I’m putting my trust in Allah” is incorrect…the correct way to seek Allah’s rizq, practise tawakkul and seek Allah’s help in attaining that rizq would be to do our part: look for jobs, get in our CVs, ask people who may know of vacant job posts, etc. Take some action, some steps, towards what we’d like to/need to attain. Just like when Isma’il doesn’t take a few steps to pick up his toy dragon *when he is able to* (when he *easily* can, in the case of Isma’il actually, lol, funny boy) and wants me to do it all, I don’t always get it for him…because I want to teach him that he has the ability to. So, in extention, shouldn’t we do our part in moving towards the things we want, and then asking Allah for His Help? (of course we can make du’a for Allah to help before taking our steps towards our goals; my point is that we should try to insha’Allah be doing, as well as praying/asking). A reminder to myself first, bi’ithnillaah. And to Allah belongs the Highest Example. As Allah states in a hadith qudsi that if you take one step towards Allah, Allah will take many towards you; go to Him walking, and He will come to you running (Al-Bukhari). Subhan’Allah. So Allah is more keen to help us and will give us more than our efforts; we just need to make the effort. So let’s look to our lives, Dear Readers…is there a situation that we want to see changes in? Is there something we are asking Allah for? Is there something we’re unhappy with? What small steps can we take to do our part, so that when we do make du’a to Allah for it/to change it, we know we’re serious about that du’a as we’re working towards it…? May Allah assist us all, ameen. I think what triggered this whole thought process before Isma’il and his toy was that I had watched a lecture entitled ‘Praying for Success’ (Nouman Ali Khan lecture, which I’ll link below, insha’Allah) which spoke about exactly that…that we should pray for success but that success consists of two parts: your effort, and Allah’s barrakah. After watching the lecture, a few days/a week or so later, Isma’il and his toy object brought the lecture to life and cemented it (! ), masha’Allah. May Allah accept Brother Nouman Ali Khan, and Isma’il (:-D), from the righteous, for the lessons they taught me, ameen. Allahumma zid wa baarik, ameen. *Any mistakes are my own and all good is from Allah ‘azza wa jall. 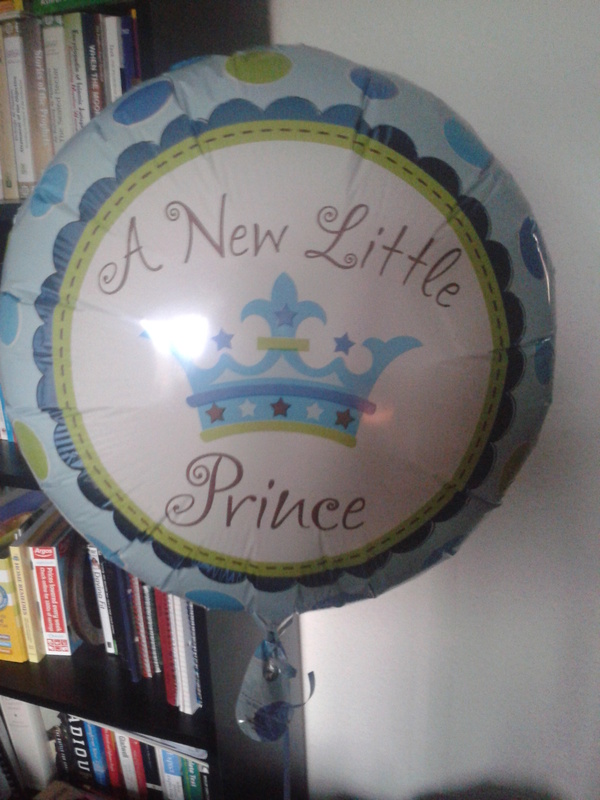 I have a new beautiful blessing from Al Wahhab alhamdullilah: a baby boy. So I get up in the night to feed and change him. I go to the bathroom to put warm water in a small bowl to use for changing his nappy. It was on one of these occasions that I found myself wary of dipping my cotton wool into the bowl…But I have just woken up and haven’t washed my hands before dipping my hand into a bowl, I thought. That’s why I felt wary! I couldn’t recall the hadith in its entirety, but I recalled the command to wash the hands three times post waking up alhamdullilah. A sunnah I’ve now begun implementing, ahamdullilah. This lead to another thought. Another sunnah which I’d read of, which I was trying to make habitual. When waking up to pray salaatul fajr (or for any other salah), one would precede it with wudu anyway, which includes snuffing water three times, as well as washing the hands three times, so one would have the commands of both ahadith covered insha’Allah. And Allah knows best. But when one is simply waking up, and not for salah (after a nap, for example), snuffing water and washing the hands three times would need to be done as one would most likely not be performing wudu. A side comment regarding the hadith which commands snuffing: The Prophet SAW said that the Shaitaan spends the night in our noses. So what does that mean? Exactly that; that indeed, the Shaitaan does spend the night in our noses! For the Prophet SAW speaks the truth and what is from him pertaining to our deen, is from Allah SWT. We must not fall into the traps of Shaitaan where one thinks ‘that’s weird’ or ‘how does the Shaitaan do that?’ etc. We have not been told, and we do not to need to know how, but we believe it with conviction due to who said it, SAW. So we implement it, without delving into the how, and move on. “Whoever revives an aspect of my Sunnah that is forgotten after my death, he will have a reward equivalent to that of the people who follow him, without it detracting in the least from their reward.” (At-Tirmidhi).